Just two more days to go for this month's challenge to end. I hope you guys have had the chance to see the many examples of handmade embellishments showcased by the team. I am here to add one more to the lot. I saw a card somewhere with a Chalkboard on it that was so perfect and I thought, how did someone make that??? Then I realised, that it was a part of the Card Kit from Simon Says Stamp but the thought stuck with me. 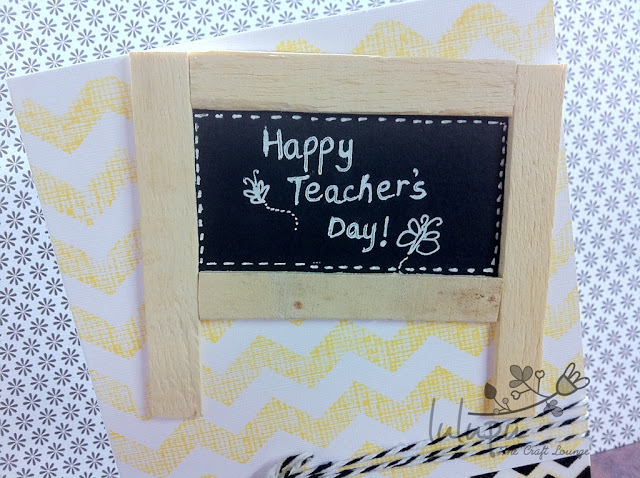 I wanted to make a card with a chalkboard on it and since Teacher's day is just a week away, I thought it would be great to do that! I wanted to use Patterned paper, but was dying to try out the Chevron background stamp from Hero Arts, so tossed the PP idea into the bin. 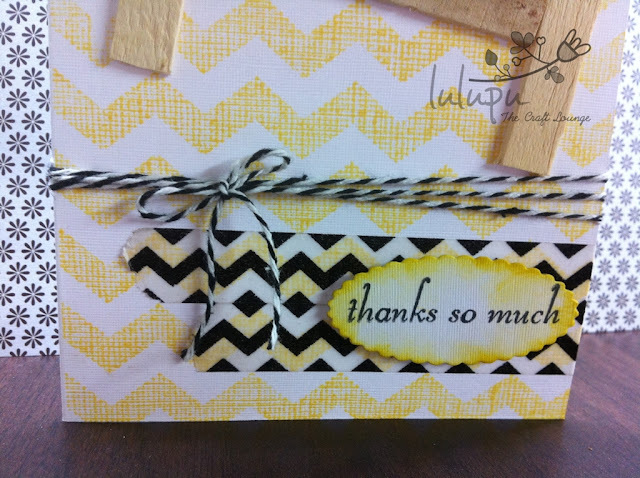 I also added a little zig zag washi tape (keeping in line with the Chevron) and some twine. 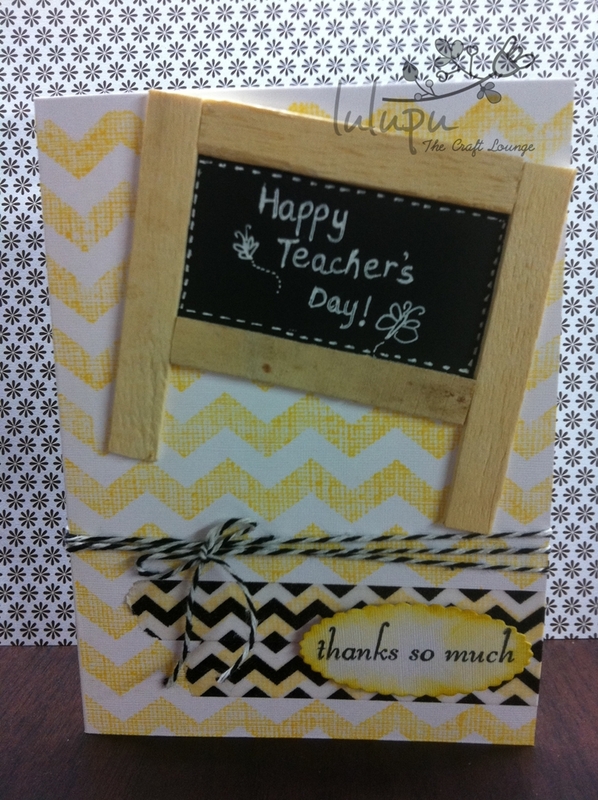 Here's how the card turned out. As usual, I have a video for you on how I made this. Here it is..
Hope you guys have entered your links for our challenge!! See you on the 1st with a new challenge! 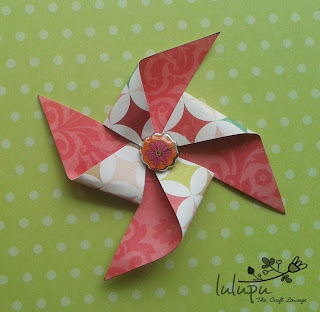 I have always loved Pinwheels on cards and layouts and untill yesterday thought that they needed expensive dies to make, but guess what not only do they NOT need any dies they are also extremely easy to make! 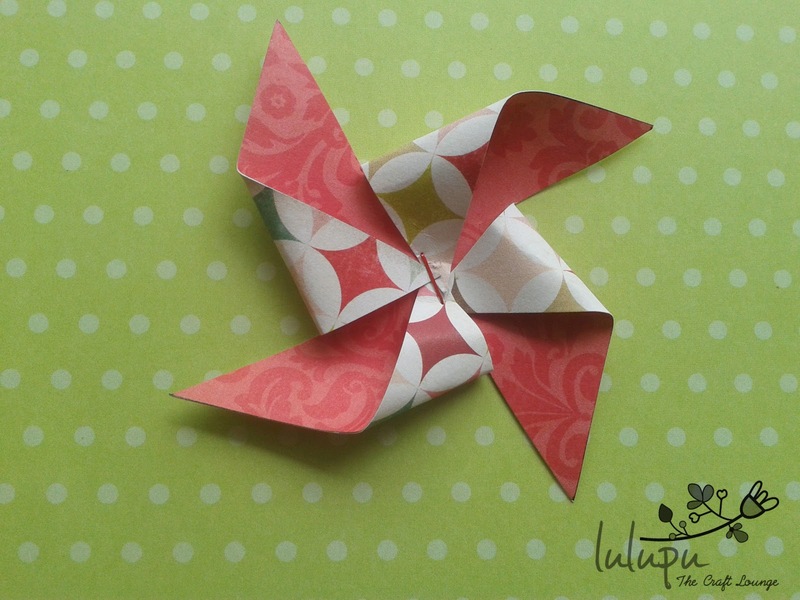 Incase you've also wanted to make a pinwheel and thought they were too much work this tutorial is just for you! 3. Used glitter pen refill for the pinwheel stick, I say glitter pen refill cause these are thicker than a regular ball point pen refill, you can use either. 4. 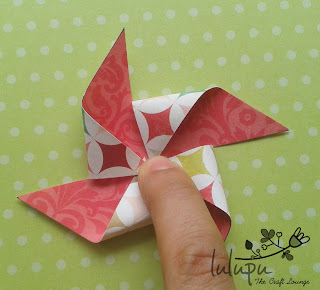 Washi tape in coordinating colors to cover the refill. 5. Some ribbon for the bow on the stick (this is optional). 6. Scissors, stapler, glue, hot glue gun (optional, you can use fevicol or any other craft glue instead). First up cut your double sided patterned paper into a square of desired dimension. I used a 2.5x2.5inch piece of paper to create a pinwheel embellishment for a 6.5x6.5inch card. 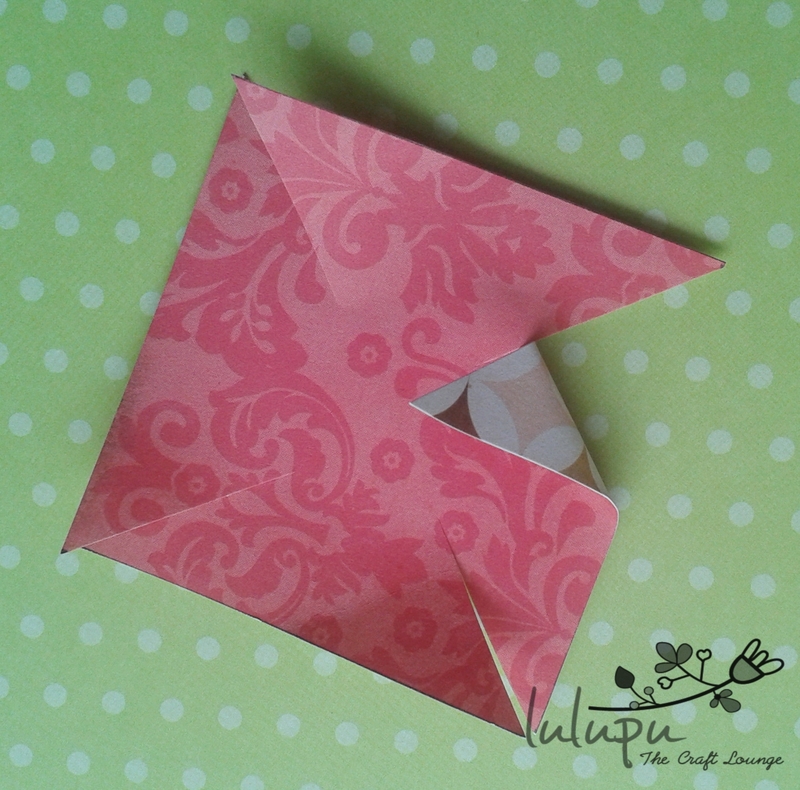 Make diagonal cuts from each corner of the square towards the center. Do not cut all the way through to the center, stop a little before it. You will get four sections which look like this. Fold over one corner of one section into the center of the square. Repeat with the same corner for the rest of the sections, your paper should look like this. 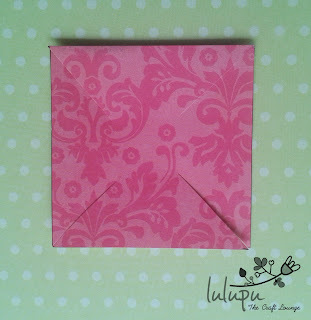 Make sure that all the corners overlap a bit and staple them in place. Place a brad or button to cover up the staple. 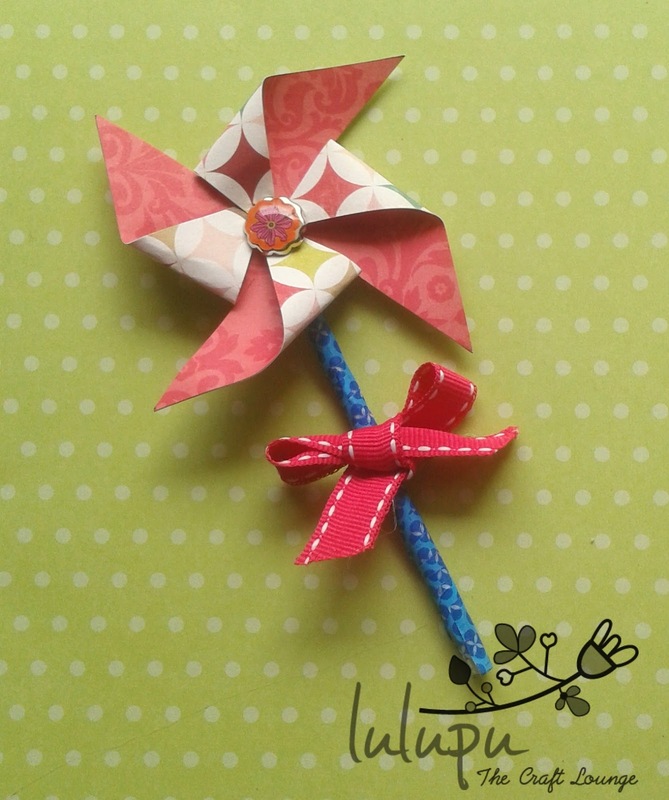 Now for the stick, cover up the used refill with washi or any other decorative tape and secure it behind your pinwheel with hot glue. You can also hot glue a small bow on the stick. and here's a finished card with the Pinwheel. Incase you haven't already (or even if you have) do participate in this months challenge....details can be found here...hurry only a few days left! 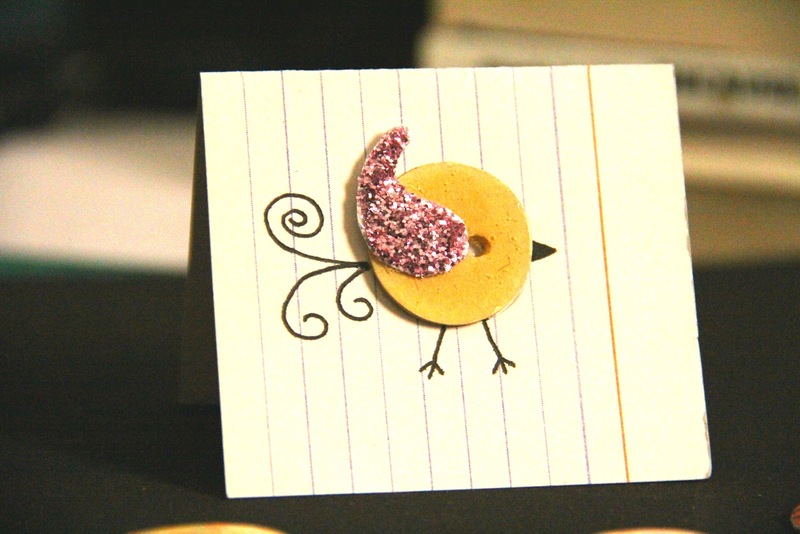 I hope you are having a good time learning new ways to make your own embellishments! I sure am learning a lot from this fabulous team out here at Lulupu! 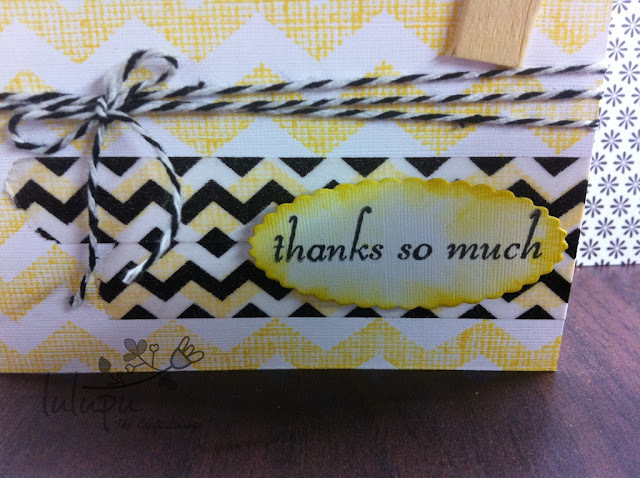 I love to make my own embellishments.. be it for my cards or layouts! One of my favorite embellishments is a button. There have been times when I struggle to find the perfect colored button for my project.. But recently I found a awesome and also a cheap solution to that. I got a way to make my own buttons! To find out how.. check out the tutorial on how I made not only a button from scratch but also a cute little birdie of the button! 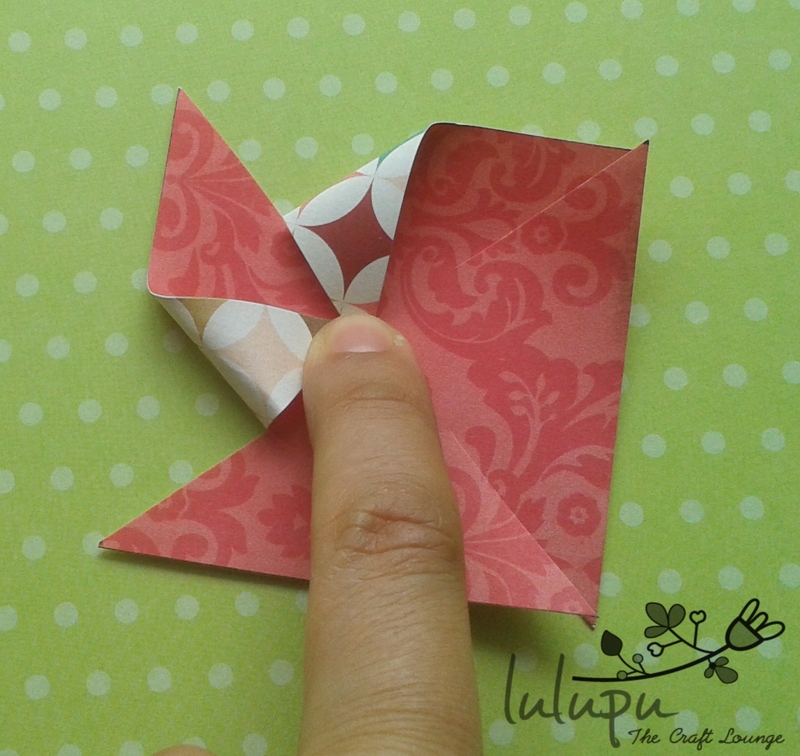 Don't forget to participate in this month's challenge, the details can be found here. 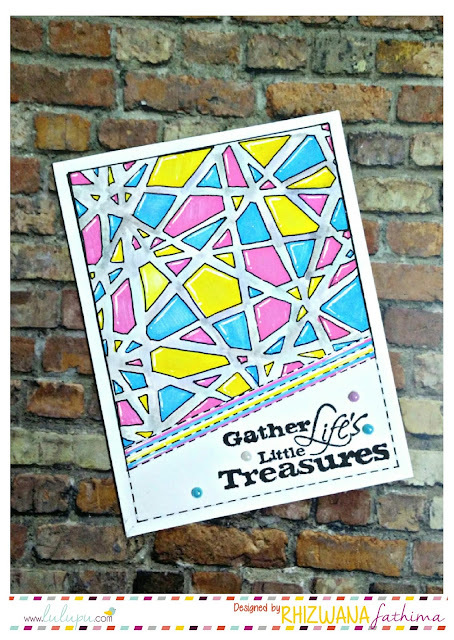 I can see that you all are having fun at this month's challenge.Lots of fantastic entries and lots of inspiration from the DT members too. I am here with mine for the same. I have uploaded a tutorial on the same. 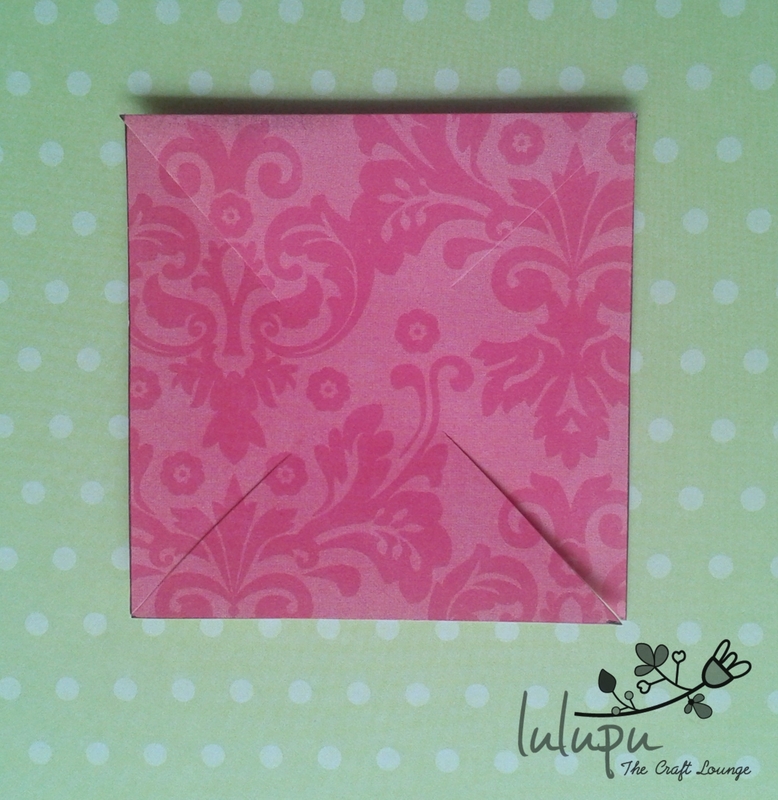 You can use it on envelopes like the one here. .Hope you find the embellishment inspiring enough to try . I've been having a great time learning how to make embellishments on my own from the lovely ladies on our team. And I can see that you guys have been having a great time playing along too. 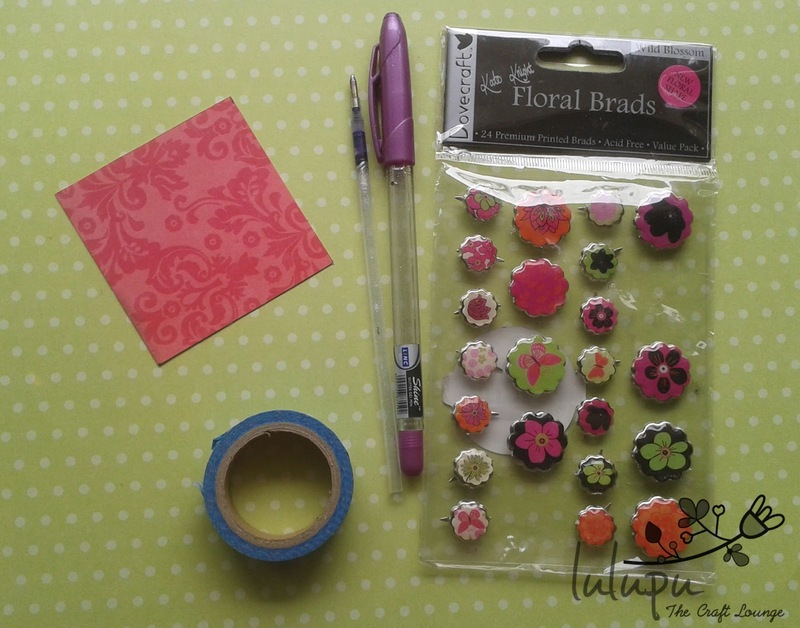 So allow me to add a few tips at making your own embellishments, using Quilling strips. I have had the chance to go through the submissions for this month's challenge and many of you have used Quilling. :) But I would like to mention one thing though. Most of the Quilling I have seen only has flowers and leaves or variations of that. 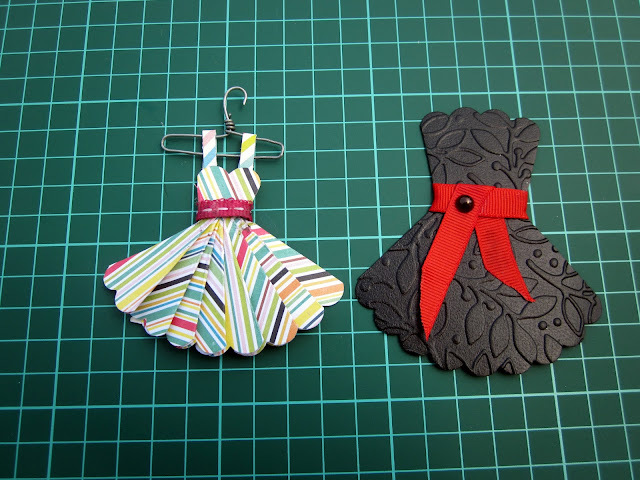 But there is so much more that can be done with Quilling. You can try anything from animals to birds to even food items like cup cakes (I've seen Quilled cupcakes and chocolates, and they look yum!!!!) The list is endless. It's just a suggestion and you have eleven more days to come up with something awesome and we can't wait to see what you guys cook up. Speaking of doing something other than flowers for Quilling, I decided to go with fruit. Not something very difficult or complicated, but fairly simple - a Lemon. You go about making it just as you would make a flower, but with a few things different. 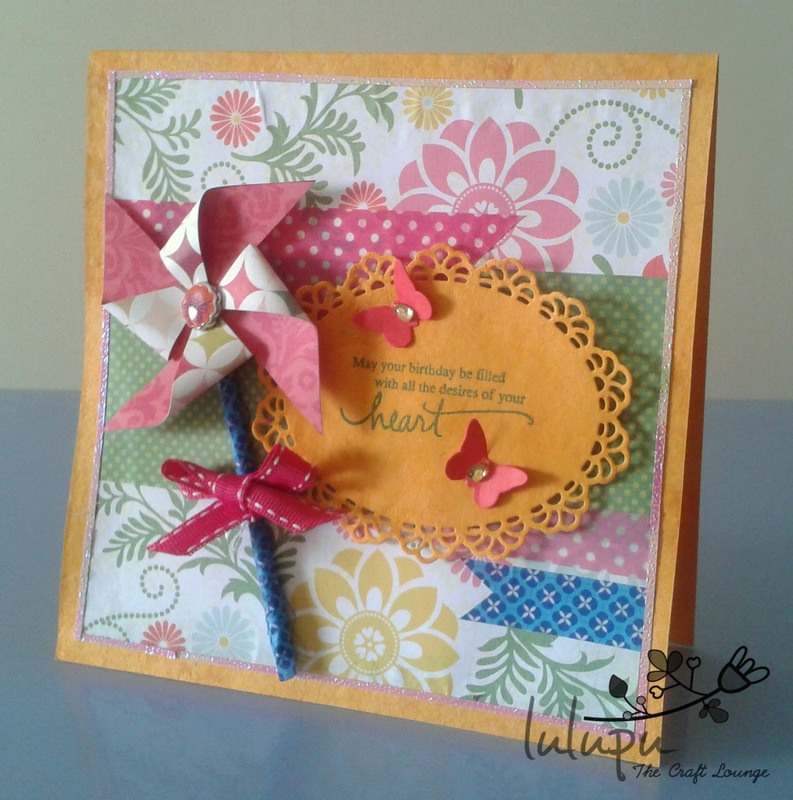 To know more about how the card was made, watch the video..
For this month we have a special post by the winner of our last challenge! Welcome Pooja Parate! She has some lovely ideas on "making your own establishment" which finally comes out as a home décor project and is absolutely stunning! Thank you Pooja for inspiring us all with this special post! Hi everyone I’m Pooja from “Lightbox Creative Ideas”. I am a teacher by profession and I love crafting. I started blogging 2 years ago and soon after that I caught the craze of making handmade cards .I love doing handmade embellishments and that’s the reason I decided to put up a tiny store called “Lightbox Creative Store” for all things handmade specially embellishments for crafters. I spend a lot of my free time making cards and filling up orders for handmade flowers. Its has been really a great journey for me since I met so many lovely ladies from the indie craft world and learnt so many things. I hope this journey continues like this. Last but not the least I want to thank the Lulu Poohs to give me the opportunity to become a Guest designer; it’s a great moment that I will cherish always. God bless. 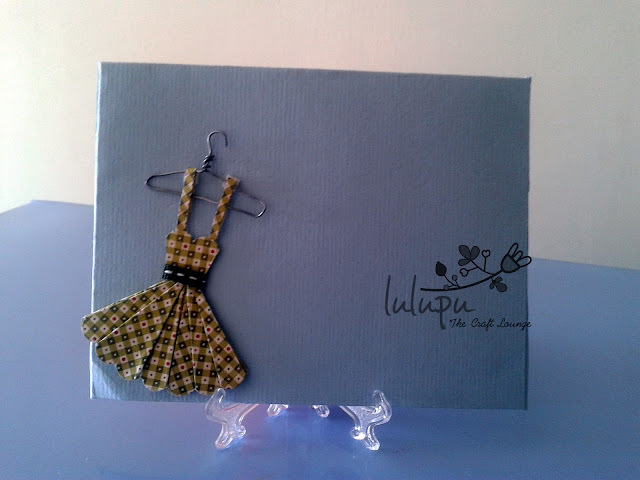 Hi all, Its Pooja this time posting as a Guest designer for Lulupu. I just happened to have a look at my scrap basket. And I decided all that scrap needs to be used !! That can be used as stickers to adorn any project. I up cycled the insides of an old canvas instead, that I had sitting on my wall for ages! I painted the borders in white and stuck my square embellishments inside. Its really up to u how u choose to put it together . The papers I have used here are from echo park, dear lizzy and authentique . Some die cuts, some old tags, left out flowers, buttons, sentiments, stickers, glue etc. If you are like me then, u also keep a stack of die cuts that u must have previously cut for a project and decided not to use but in this project those came in handy. Next I just went on filling the squares with the things I had J and that’s about it ! And then I assembled everything on the inside of an old canvas frame! Hope u all enjoyed my post as much as I loved doing it! Hope to see some exiting and fun entries now! Winner and top 3 of July Monthly Challenge!